We had some particularly fantastic marketing campaigns this year. 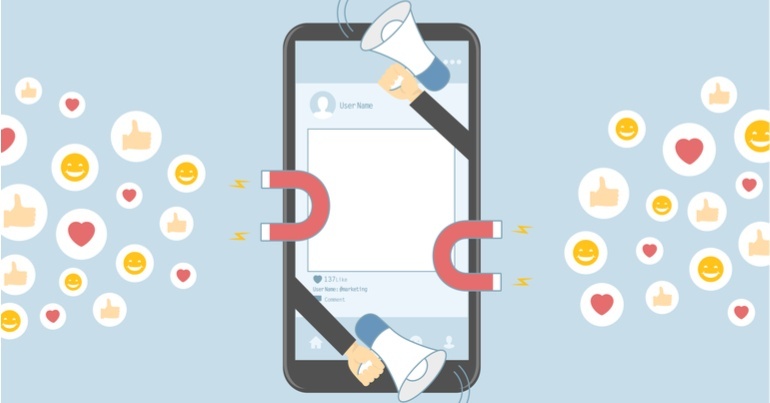 Here's our five favourite viral marketing campaigns from 2018. Gravity is a blanket designed to weigh 10% of your bodyweight. Gravity got its start on the crowdfunding website Kickstarter, where the founders of the company initially claimed that it could treat insomnia, reduce stress, increase relaxation, as well as be comforting for people with post-traumatic stress disorder and autism, among other things. It didn’t take long for their crowdfunding project to go viral, but it also didn’t take long for something to go wrong. Two weeks into its crowdfunding campaign, having already raised a whopping $ 2 million USD, Gravity got word from Kickstarter itself that it had to change the language in its marketing because “treat insomnia” alludes to the kind of scientific backing that the company didn’t have. 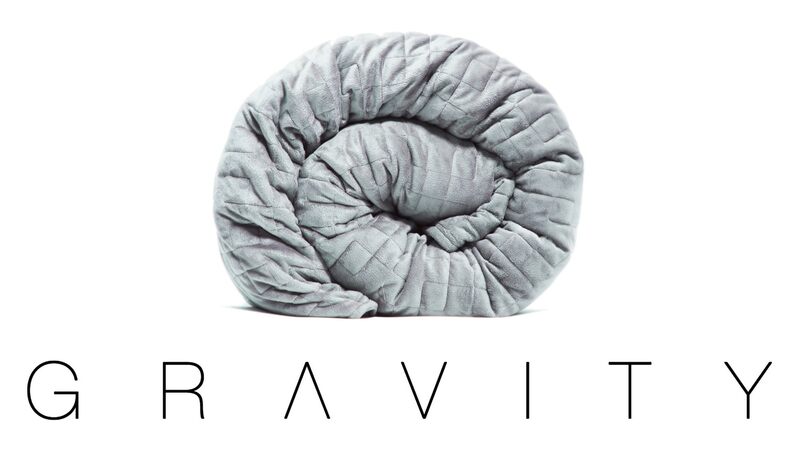 Upon re-examining its marketing, Gravity concluded that their users weren’t actually looking for a medical blanket with scientific backing: they just wanted to be cosy. Gravity pivoted their marketing to embrace this, ended up raising close to five million dollars on Kickstarter in total, and eventually partnered with big retailers like Target and Amazon. Using creativity to turn a bad situation into something positive is what great marketing is all about, and Gravity is a great example of this. The Superbowl is not just a game of Gridiron, it is also the most important advertising event of the year, and the best ads America have to offer are on display. The competition couldn’t be more fierce, and it’s always exciting to see which brand comes out on top as this years’ proverbial winners. There is no doubt that Tide came out on top during the 2018 Superbowl. The laundry detergent company rolled out a marketing campaign so smart that it effectively turned other companies’ Superbowl ads into Tide ads. Nobody could have predicted that a laundry detergent brand would end up being the talk of the town. The series of clips, starring Stranger Things actor David Harbour, would start out like stereotypical Superbowl ads for cars, beer or medication before being interrupted by Harbour saying something like “There are no stains. Look at those clean clothes. It’s a Tide ad”. Brilliantly, Harbour also says “Does this make every Superbowl ad a Tide ad?”, forever linking every rival advertisement and the clean clothes they wear in them with the thought of Tide’s genius advertisements. Between this campaign and the slightly unfortunate Tide Pod Challenge, Tide certainly had an incredible amount of attention in 2018. IHOP, the International House of Pancakes, is an American restaurant chain specialising in - yeah, you guessed it - pancakes. However, that was all about to change. On June 4, IHOP flipped the P upside down, changed their Twitter name to IHOb, and started sending out cryptic tweets. People started realised that this was more than an elaborate joke from the company as the days went on because IHOP changed its branding in their restaurants as well. A week after their initial tease, they announced that the B stood for burgers, which would become a new staple on their menu. The marketing campaign was clever, funny, and extremely cost effective. The number of mentions of @IHOP on Twitter increased by a staggering 6,500%, and their hashtags #IHOP and #IHOb garnered an incredible 300 million impressions in the week leading up the the reveal. Even news media got in on the action, directing even more eyes to the company. The one downside to this clever campaign was that some Twitter users were unsure if the company would get rid of pancakes entirely, which they obviously did not. Since the launch of their burger range, they have switched all branding back to IHOP. Music streaming service Spotify continues to grow year after year, and should be a household name for most. 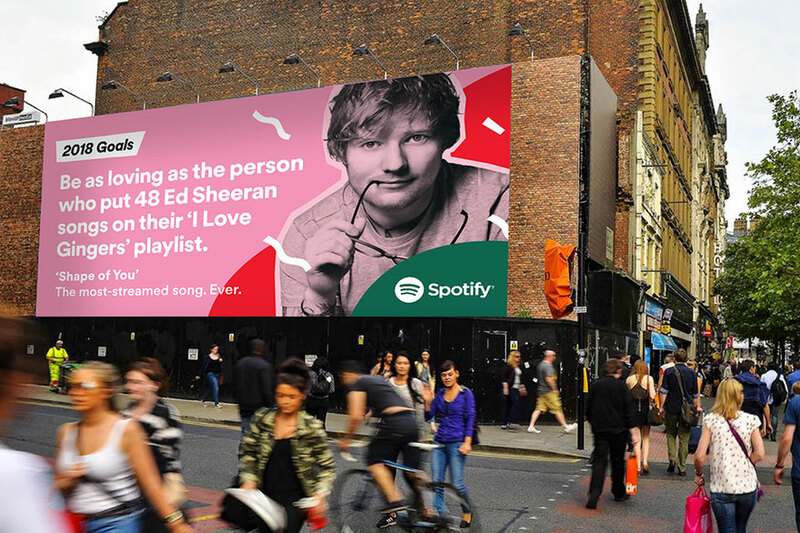 Spotify flexed their creative muscles yet again for “2018 Goals”, a marketing campaign that would kick off their 2018. 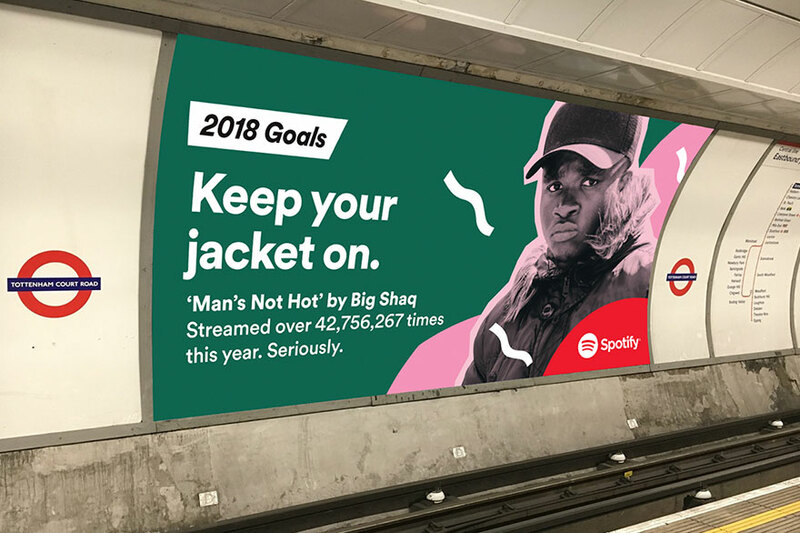 Conceived, created and executed in-house, the 2018 Goals campaign was comprised of billboards out in the real world that harnessed unique user data and behaviour in a very humorous way. The campaign ran in seven American cities and 18 other global locations, and included variations related to the geographical location of the ads . For example, an ad placed in London read “Be significantly less proficient in goodbyes. ‘Too Good at Goodbyes’ streamed over 910,925 times in London. The 2018 Goals campaign kicked off what would become Spotify’s best year yet. They tripled their revenue in the first quarter of the year and went live on the New York Stock Exchange in quarter two. When Nike' Dream Crazy campaign was an immediate worldwide sensation from the minute it launched in September. 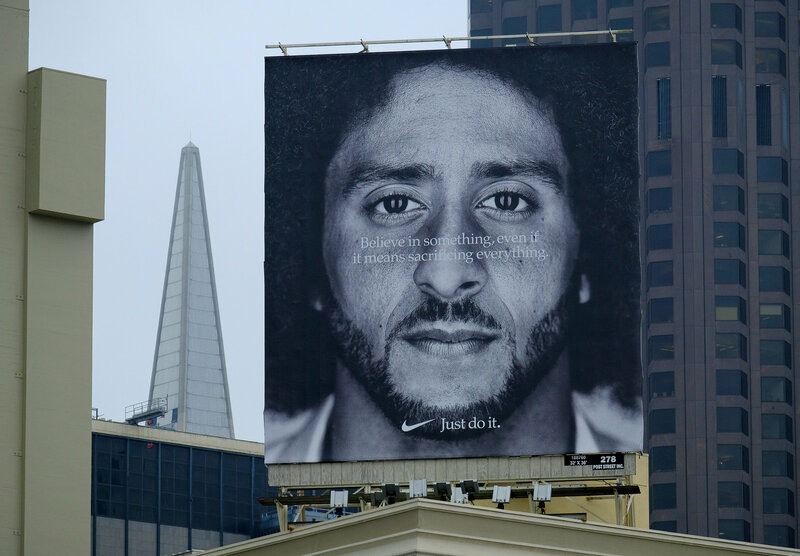 Created as part of the 30th anniversary of the iconic “Just Do It” slogan, the advertisement features a number of prominent athletes, but front and centre was Colin Kaepernick. The American Football quarterback and current free agent was infamous for kneeling during the national anthem in silent protest against police violence. Nike embraced the controversy surrounding him and made Kaepernick the star and narrator of the campaign, and it paid off. Big time. The campaign immediately set the internet ablaze, and sparked either criticism or praise from the usual suspects. Despite active efforts to boycott Nike over these advertisements, Nike’s stock would rise by 5% in a month, netting the company an approximate 6 billion dollars. Burning bridges with a few fringe groups likely won’t affect Nike negatively at all, and this campaign fits in perfectly with their recent repositioning and rebranding as a socially conscious company. A two minute advertisement, and a couple of pictures. 6 billion. Not a bad return on investment.